Do I need to install anything on my computer to use the VC? Download "Do I need to install anything on my computer to use the VC?" 1 FAQs How does the Virtual computer work? Essentially, the computer accessing the Virtual computer acts as a wireless mouse and keyboard. The applications themselves are running on IT Sligo servers in a data center, but the mouse and keyboard commands are coming from the device from which the Virtual computer is accessed. Do I need to install anything on my computer to use the VC? Yes. If you are accessing the VC from a laptop or desktop computer, you will need to install the Citrix ICA plug-in. If you are accessing the VC from a mobile device, you will need to install the Citrix receiver. You will be prompted to download and install the plug-in the first time you log in to the VC. Both are designed to support a connection across the network permitting you to launch and use applications running on a server. What is the Citrix ICA plug-in/citrix receiver? The Citrix ICA plug-in permits the VC and your desktop or laptop to communicate. You only need to install the plug-in once per computer. You may be prompted more than once on your machine if you access the VC from a different browser. The Citrix receiver is an app that needs to be installed and configured on your mobile device in order to access the VC. The Citrix receiver is available from the app distribution service for your mobile device (AppStore, Android Market, etc.) The Citrix receiver is also an optional method for using the VCL on your desktop or laptop. What are the differences between the plug-in and the receiver? The ICA plug-in is specific to laptop and desktop operating systems, and is what you are prompted to install the first time you log in to the VC. Using the plug-in means fewer updates. If you are using a Mac to access the VC, the plug-in may also mean printing requires two prompts before your document successfully prints (See "Why am I prompted twice when I try to print from the VC?"). To avoid this, install and configure the receiver, available from the app distribution service for your mobile device (AppStore, Android Market, etc.). The Citrix receiver is the only way to access the VC from a mobile device. 2 Why am I being asked to install the Citrix ICA plug-in again? If you visit the VC from a browser other than the one you used to install the Citrix ICA plug-in, you will likely be prompted to install it again. If you are certain that the ICA plug-in is already installed, click Skip Installation on the VC login page to continue to the Application Library. You may also be prompted to install the ICA plugin if you decide to use the Citrix Receiver application instead (See "What are the differences between the plug-in and the receiver?"). 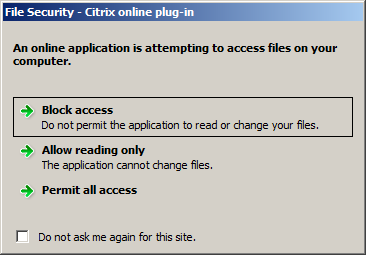 How can I check to see if the Citrix ICA plug-in/citrix receiver is already installed? If you aren't certain whether the plug-in is installed on your computer or the receiver is installed on your mobile device and don't know how to check, follow these steps: To confirm that the plug-in is installed on your PC: 1. Launch the Control Panel. 2. Click Programs. 3. Select the Programs and Features folder. 4. If Citrix online plug-in -web exists in the folder, it is installed, and you can select Skip Installation. To confirm that the plug-in is installed on your Mac: 1. In Finder, select Macintosh HD. 2. Open Library. 3. Open the Internet Plug-Ins folder. 4. If ICAClientPlugIn.plugin exists in the folder, it is installed, and you can select Skip Installation. How can I access files stored on my local machine (desktop, laptop, mobile device)? The VC can access files on the local drive of your computer or mobile device. Click Computer in the left-hand navigation bar of the dialog box. This will list all the storage devices the application has access to. Your local hard drive should be listed as Local Disk (C: on 'YOUR_COMPUTER_NAME'). Selecting that drive will bring you to the root of your local hard drive. 3 I tried to save a file locally, and now I am being asked to allow access. What should I do? (Mac and Windows 7) For security purposes, you must give the Citrix Online Plug-in permission to access your hard drive. You may be prompted to do so when trying to open or save a file. You can select Read Only access if you are opening a file for viewing purposes only and do not plan to edit or save the file. If you would like to be able to edit or save a new file, choose Read & Write. This will grant access to the Online Plug-in for this session only. You can permanently give the Online Plug-in access to your local hard drive: 1. Click the Apple icon in the top left corner of your screen, then select System Preferences Click Citrix Online Plug-in in the "Other" section of System Preferences. 3. Click the Devices tab. 4 4. Locate your hard drive in the list of mapped drives. 5. Select your preferred level of permissions from the "Read" and "Write" columns. Why am I receiving a File Security pop-up every time I open an application? (Windows) In order for the VC to open or save files to your local hard drive, Windows requires that you grant the Citrix Online plug-in permission to do so. 5 You can select Allow Read Only access if you are opening a file for viewing purposes only and do not plan to edit or save the file. If you would like to be able to edit or save a new file, choose Permit All Access. This will grant access to the Online Plug-in for the current session only. You can permanently give the Online Plug-in access to your local hard drive by checking the box next to Do not ask me again for this site. You may be required to check this box of for each application in the VC. Suggestions, application requests, and general feedback are encouraged! General feedback, requests for changes, and application recommendations for inclusion in future releases of the VC are welcomed by sending an to with the subject VC All submissions will be reviewed. Windows Installation 1. On a Windows PC (For MAC, skip to next section), at the file download prompt click Run. www.dropbox.com Dropbox File Backup and Access Anywhere (Windows PC and Mac OSX) Contents Introduction... 2 Step 1. Download and Install Dropbox... 3 Step 2. Finding My Dropbox (Windows PC)... 5 Step 3. The same as the Bold convention (see above) but with the intent of providing a greater emphasis.